Watching red squirrels disappear into tree tops was one of the more unusual experiences in my DIO career. I’m a Senior Training Safety Officer on DIO’s training estate in Northern Ireland and somewhat unpredictably, red squirrels have been part of my working life for the past few months. It’s made a nice change from my usual role making sure that training is running smoothly and safely on our training estates here. DIO’s responsibilities range beyond the major construction projects which spring to mind for most people such as MOD Lyneham or Beacon Barracks. We also manage the military training estate and as such, we are responsible for the stewardship of the land and its wildlife. As you probably know, red squirrels struggle in this country because of grey squirrels, which force them out of their home territory and carry a virus which is fatal to the reds. This means that they are only really found in limited wooded rural areas, such as the highlands of Scotland, Anglesey, and Northern Ireland. We’re doing our bit to help by supporting a Belfast Zoo programme to breed and release red squirrels in to the local woods and forests. We were approached by the Northern Ireland Environment Agency and Belfast Zoo in April 2015 and readily agreed to help if we could. They were keen as there are no grey squirrels on the training estate and they were looking for a nursery site to support the breeding programme for red squirrels. The plan is for the young reds to spend twelve months or so with before being released out to other larger locations to supplement the wild population. After a medical check-up the zoo staff brought two young male reds, which were released into a specially-built soft release pen in the woods of Ballykinler Training Area. After a week or so they were released into the woods proper. Two days later the zoo asked if they could bring another three males down to the pen. All five are now living in the woods at Ballykinler with support from supplementary feeding from feeding stations and shelter being provided from the ten nesting boxes. We have seen them and they seem to be doing well. We are capturing them on film from the nature camera system we have set for monitoring. 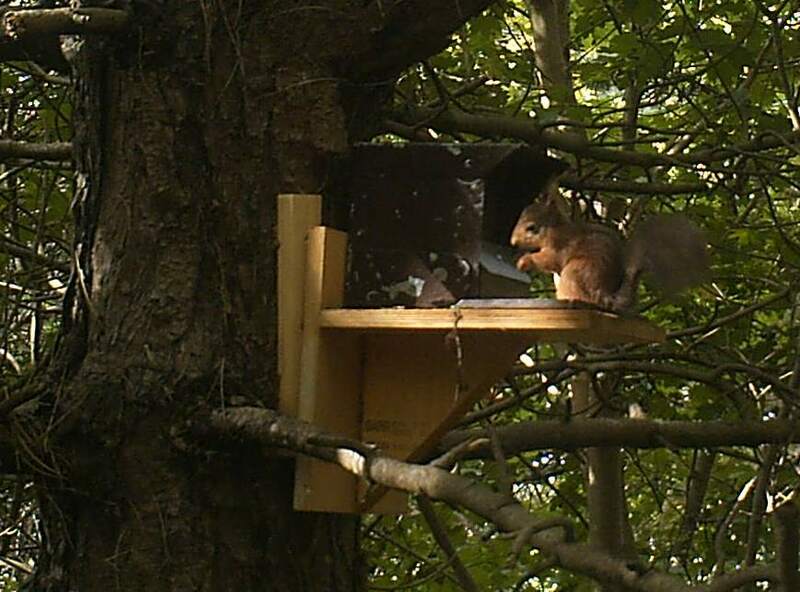 Ballykinler has numerous wooded areas which divide the firing ranges to prevent troops accidently straying into potentially dangerous areas, so there are plenty of trees for the squirrels. Because the woods divide the ranges, they are in the safety buffer between ranges and not targeted during the firing, so they are perfectly safe. Ballykinler has water on three sides and there are no grey squirrels here, which also makes a big difference to their chances. The woods also reduce the noise of the firing and it certainly hasn’t seemed to bother the reds so far, which we thought would be the case as our 200 seals live behind the ranges and feel safer on our side of the bay and away from humans. The programme is being overseen by the Northern Ireland Environment Agency and we’re working closely with them and staff from Belfast Zoo to do what we can to ensure the success of the project. The first five male squirrels were released a couple of weeks ago and there are more to come. After a year, by which time they should be well and truly adjusted to living in the wild, they will be recaptured and relocated elsewhere in Northern Ireland. 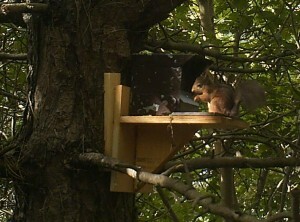 With luck, then, we will be part of increasing the population of red squirrels here in Northern Ireland. Interesting, where do the female Reds fit into the plan? Hi Paul, thanks for reading and great question. Because it's a breeding programme, the females are more important than the males. Assuming that the males adjust to the weather and circumstances at Ballykinler and make it successfully through the winter, females will be introduced next year. Well done this is good news. I would love to the red squirrel back in Southen England. I have some one regularly shoot and trap greys in our woodland in kent. The body count is going down year on year so must be making some progress in getting rid of them. One question why are only males being relased ? Hi Paul, thanks for your kind words. We've passed them on to Tony. The answer to your question is that because it's a breeding programme, the females are more important than the males. Assuming that the males adjust to the weather and circumstances at Ballykinler and make it successfully through the winter, females will be introduced next year.